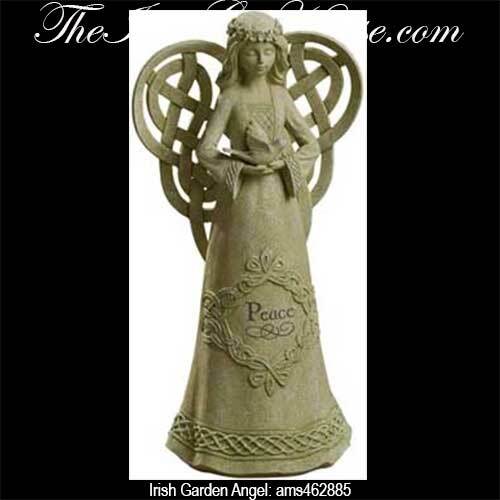 This Irish garden angel features Celtic knot wings along with a blessing of peace. Sorry, this Irish angel statue is now sold out. Due to the weight and size of this Irish garden angel, it ships separately and ONLY by ground freight. Typical delivery is 5 - 7 days. This Irish angel statue will look stately in your garden. The Irish garden angel features a dimensional design that includes Celtic knot wings along with knot-work on her dress and a shamrock laurel on her head. The Celtic angel is further enhanced with a dove in her hands and a blessing of peace; she is made of cement and resin, weighing about 9 pounds, and measures 9 1/2" wide x 18" tall x 6 1/2" deep. The Irish garden decor is received with shamrock and Celtic knot history cards, complements of The Irish Gift House.